SARAWAK, Malaysia’s largest region by land area, is one of contradictions. While amongst the richest in terms of natural resources, including hydrocarbon and timber, it has also been amongst the poorest. Data shows that its top-line economic growth has not trickled down to its nearly three million population. Yet, Sarawak has been an outsized contributor to federal coffers by way of its substantial oil and gas reserves through the decades. 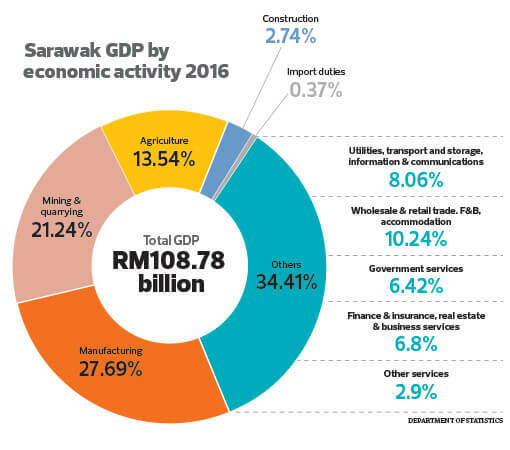 According to the Department of Statistics, Sarawak had among the highest GDP per capita among Malaysian states, at RM44,333, in 2016 — just behind Selangor (RM44,616), Kuala Lumpur, Labuan and Penang. 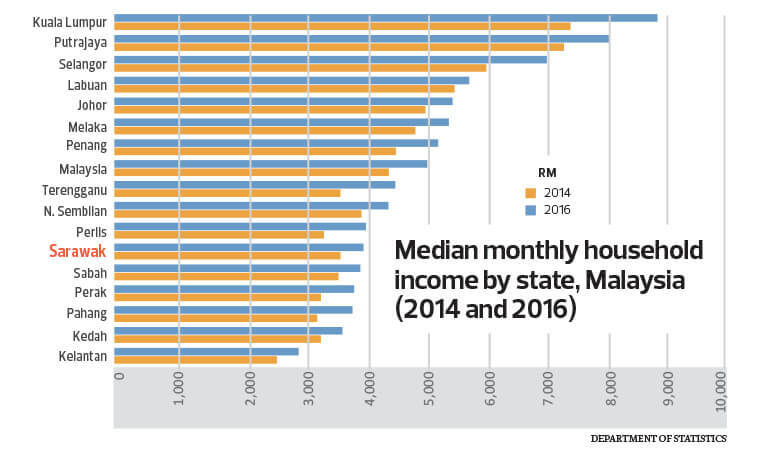 However, its median household income in 2016 was RM4,163, well below the national average and among the lowest for Malaysian states. 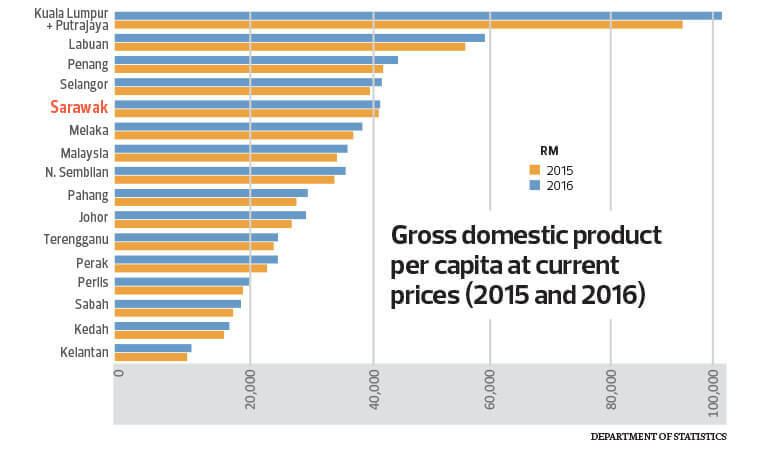 For perspective, the national GDP per capita was RM38,887 in 2016 while the median household income was RM5,228. Anecdotally, economic opportunities have been relatively scarce in Sarawak with the public sector often seen as the primary source of employment. Its relative isolation on Borneo island has been a disadvantage both for local businesses and in attracting companies that would create jobs. It is not uncommon for Sarawakians to pursue their higher education and subsequently build careers in Peninsular Malaysia instead of returning home. But the current chief minister, acknowledging the disparity between GDP growth and income levels, seeks to change that. Since taking the helm a year ago, Datuk Patinggi Abang Abdul Rahman Zohari Abang Openg, popularly known as Abang Johari, has been busy erecting the building blocks for his ambitious vision — high-income status for Sarawak by 2030. Sarawak is using the World Bank’s definition of high income, which sets the benchmark at gross national income (GNI) per capita of at least US$12,235 (RM47,420 at current exchange rates). To get there by 2030, “we must have average annual economic growth of 6% every year”, he tells The Edge in Kuching. 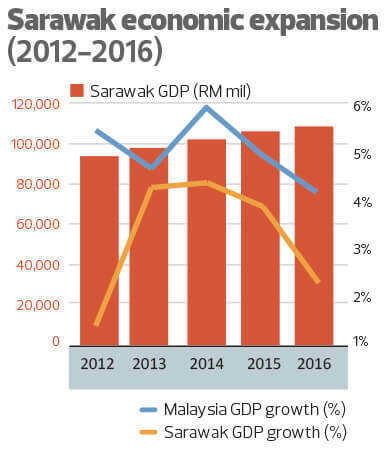 It is a tough task as Sarawak’s GDP has not expanded faster than 6% since 2011, during Tun Abdul Taib Mahmud’s time as chief minister. On top of that, its revenue has been falling, hit hard by falling crude oil prices, among others, since mid-2014. In 2011, its GDP grew 6.4% year on year, outpacing the national GDP growth of 5.3%. However, its economy has since underperformed national economic expansion. “If we increase our public spending, that will trigger economic activity, for example, in construction and services. That will give, I think, an additional growth of 2% (per annum). Now we are averaging 4%,” says Abang Johari. With revenue under pressure, the region is looking to its reserves of about RM28 billion as at last year to fund strategic projects. To drive economic growth, Abang Johari has set his sights on going digital and filling the gaps in Sarawak’s infrastructure, including water supply and high-speed internet connectivity, instead of investing in more traditional economic drivers such as plantations and oil and gas. But that has sparked criticism that Sarawak could be depleting its savings too fast, given the scale of some of the projects Abang Johari has announced. The intention is for the bank — the Development Bank of Sarawak (DBOS) — to fund major strategic projects and collect interest income to ensure the funds are replenished, he adds. Underlying his approach is a desire to digitalise the region’s economy with high-speed internet connectivity, an e-wallet service called SarawakPay and setting up a public database to be rolled out this year. Abang Johari also plans to build a hydrogen-powered light rail line — similar to trams in Europe — connecting Kuching to Serian. Building it now would be cheaper than in the future, he explains. He dismisses cost comparisons to urban rail projects in the Klang Valley, saying the line will be cheaper as it would not be elevated and will pass through government-owned land. “Ours will go through green areas (instead of congested urban areas where land acquisition costs are higher) and we can create new transit-oriented townships” that would allow the state to offer affordable housing, he says. The light rail works will be overseen by a government-owned company akin to Prasarana Malaysia and works will begin sometime next year. Abang Johari says more details will be announced in March this year. The chief minister hopes to leverage ICT to overcome Sarawak’s geographical isolation and create opportunities for income growth. “Imagine if you produce one mobile app — the whole world is the market for your app provided you have the [internet] connectivity,” he says. For ICT infrastructure, Sarawak wants to quadruple communication towers from 1,200 to about 5,000 in two years. Abang Johari says the Sarawak government is committing RM1 billion to this while the federal government has allocated RM500 million. He tells The Edge that Sarawak is aiming for 50Mbps internet connectivity speed for rural areas and between 100Mbps and 150Mbps for urban areas. The digital economy is expected to make up 2.3% of GDP this year and 17.4% by 2025. Another way to create more jobs is via an agro-park programme that aims to promote modern farming using the latest technologies. Abang Johari says the Sarawak government has identified 600 acres in Sarikei that will be leased to entrepreneurs with sound business plans. Also in his sights are the hospitality and tourism sectors, leveraging the artificial lakes surrounding Sarawak’s four dams — Bakun, Murum, Batang Ai and the upcoming Baleh. This, alongside strategic interest in controlling Sarawak’s power generation and freshwater resources, had driven the acquisition of Bakun dam from the federal government for RM2.5 billion plus debt last year, Abang Johari explains. By the end of this year, the Sarawak government seeks to pass a new bill to create a new body to regulate the development of the surroundings of the artificial lakes, the chief minister says. “While you produce energy, you can also develop the areas around the lakes and that will definitely boost the service sector,” he says. But amid the effort to create jobs, Sarawak’s lack of basic infrastructure despite its natural riches remains a glaring problem. For example, it is only now seeing the construction of the Pan-Borneo highway after decades of requesting such connectivity from the federal government. The infrastructure hurdle would undoubtedly have added to its challenge in attracting business opportunities on top of its geographical disadvantages. This is also underscored by an announcement two weeks ago that Sarawak is embarking on a 10-year endeavour to build a water grid that would supply treated water to interior residents across Sarawak. A Sarawak minister previously estimated that 114,000 households, or 39% of the rural populace, still did not have access to clean water. The first phase of the water grid will stretch from Batang Ai in Sri Aman to Tanjung Manis in Sarikei, tapping the Batang Ai dam. It will cost about RM1 billion and is slated for completion over two years. “In any economy, the basic infrastructure must be there first,” Abang Johari says. “For us, we need steady water supply and reasonably priced power, which we have because of hydropower.